Edison Research surveyed more than two thousand U.S. citizens re using digital platforms and found that 67 percent of respondents use social media. The growth of social media as an influencing factor in our lives is truly breathtaking. 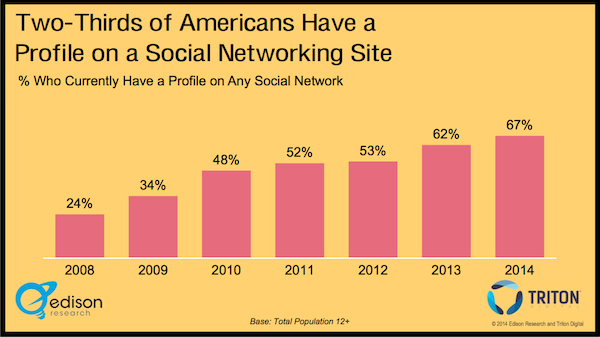 91% of American adults who are online use social media. 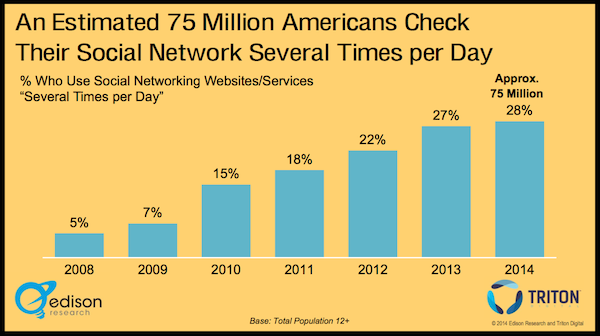 Nearly a quarter of the total time spent online is on social networks. There are now over 800 million Facebook users in the world, with more than 200 million joining in 2011 alone. Nearly 40% of those 800 million log in every single day. It is not just Facebook that’s growing either – Twitter is adding half a million users on a daily basis, and there is a new kid on the block that has managed to attract over 90 million users in just over half a year. It is relevant to you because you own a brand. It doesn’t matter if you are a part-time blogger, a small business, or a huge corporation – you have a brand. And if you have any interest in furthering your brand, you cannot ignore social media. And social media doesn’t want to ignore you. Over half of social networkers follow a brand. Moreover, 56% of consumers say that they are more likely to recommend a brand as a fan. That’s right – half of your customers are just waiting for you to reach out to them, and they are primed to promote your brand for you. You may be shrugging your shoulders at this point. You probably already use social media. But I’m willing to bet that you don’t value the power of social media as much as you should. 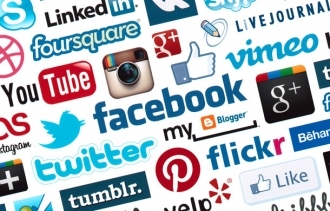 When it comes to the internet, a social media consumer is the best type of consumer. There is ample evidence to effectively argue that social media users are far more active and influential than the average internet user. Gigya recently published data gleaned from their onsite social media login platform. Analysis of the data provides some pretty fascinating insights. They found that on websites with social login functionality, logged-in users spend 50% more time on site, and view twice as many pages, than those who do not log in. The data strongly suggests that statistically speaking, people always want to be social, regardless of where they are on the web. Social media users spend the most, and are more influential on their peers, than the average internet user. They are exactly the kind of people you want to attract to your brand. Here’s the kicker – even if you already pour an enormous amount of time and resources into social media, you probably aren’t doing it in the most effective way possible (best case scenario), or you are getting it completely wrong (worst case scenario). So let’s explore what you should be doing to make the best use of social media in marketing your brand. 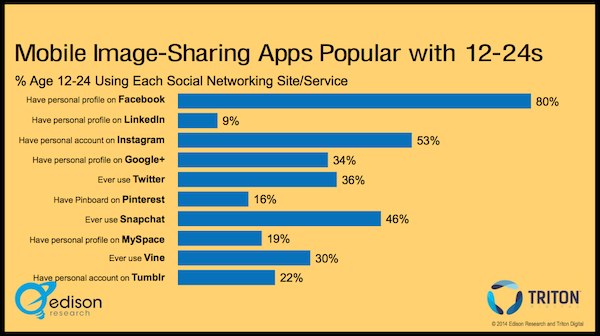 Facebook is undoubtedly the king in terms of market share, but they should not necessarily be the primary social media network that you target. Consider this – 40% of people who login via Gigya’s platform use social media logins other than Facebook. 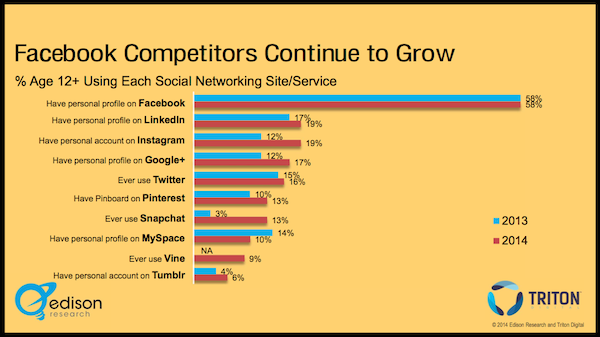 Nearly half of social media users prefer alternative platforms. When it comes to dividing your focus amongst social media networks, you would do well to consider how your resources are best allocated. The StumbleUpon fact is there as more of a wildcard than an actionable piece of data – it demonstrates that there is much more to social media success than throwing all of your eggs in the Facebook basket. As with many things in life, social media will only give you as much as you put in. 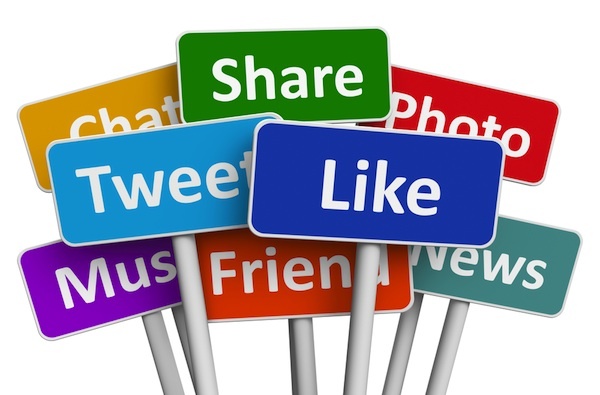 The key to social media success boils down to two factors – interaction and incentive. The same Gigya study mentioned above showed that people spend the most time on websites when they are commenting. 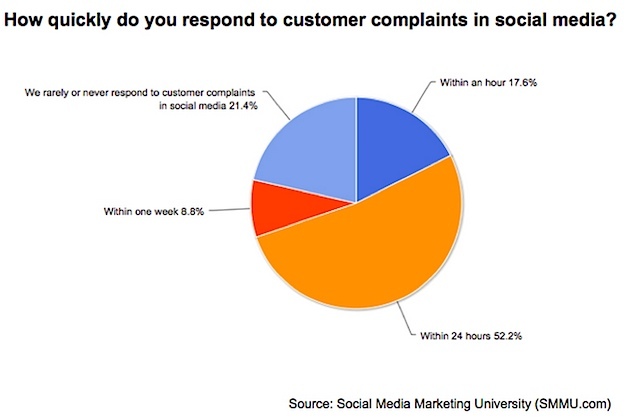 Or to put it more generally, visitors spend the most time on websites where they can voice and share their opinions. If you can engage with visitors to your site, they will hang around for longer. And the longer they hang around, the better exposed they are to your brand. Auto-posting to Facebook decreases likes and comments by 70%. If you are going to autopost, you may as well not waste your time in setting it up and do something else instead. And nearly four out of every five consumers interact with brands on Facebook primarily through reading posts and updates from the brands. Even though interaction is so plainly important, 95% of Facebook wall posts are not answered by brands. That’s a whole load of brands missing out on a whole load of potential. The first group will take care of themselves – as long as you effectively promote your social media presence, they will come across you, follow you, and begin to spread the word. It is the second group that you need to focus on primarily. In order to gain their attention, you must incentivize. Don’t just slap up a Facebook page and expect the likes to roll in – give them a reason. Social media does not have to be wildly overcomplicated. Just concentrate on offering value, incentivizing, and interacting.